What Is This CEO Doing to Earn $450 Per Hour? The questions from analysts at the end of a company's conference call typically fall in the softball category. There's often a lot of backslapping when things go well, "Congrats on the great quarter." And when things aren't all right, many analysts tiptoe around the issue, asking necessary questions to understand where things went wrong, but avoiding calling out management as part of the problem. Call me cynical, but I think there's a clear reason for the buddy-buddy relationship. Analysts work for investment banks that link companies with investors for secondary offerings. If analysts aren't nice, their co-workers on the banking side aren't going to get any business. So it was rather refreshing this week when Geron let Robert Lawson, an analyst from Catoosa Fund, ask a few questions at the end of its fourth-quarter earnings conference call this week. Presumably without any need for love from Geron's management, Lawson was free to say whatever he wanted. And, boy, did he let management have it. If you haven't been following the company, let's get you up to date quickly. Geron is most famous for being a stem-cell company, but the biotech dropped the program in late 2011. I thought it was a pretty good move considering the program was expensive and risky. The biotech had two cancer drugs that were further along. Dropping the stem-cell program allowed the company to conserve cash and focus on drugs that would get to market quicker. Unfortunately, they blew up. First, imetelstat failed a phase 2 trial in breast cancer. Then GRN1005 failed a trial testing its activity on brain metastases in patients with breast cancer. The company cut back spending, laying off much of its workforce. Operating expenses fell 37% in the fourth quarter. The new plan involves focusing on imetelstat in other types of cancer. A phase 2 trial in a blood cancer called essential thrombocythemia came back positive. The company plans to wait for data from an investigator-sponsored trial in another blood disorder called myelofibrosis expected this year before launching its own trial, a prudent move for a drug that's only batting .500. So, what's got Lawton's feathers ruffled? Since John Scarlett took over as Geron's CEO and decided to shift directions, shares are down about 40% while the AMEX biotech index is up more than 60%. Despite the poor performance, Lawton claims that Scarlett made $900,000 last year, including a $300,000 bonus. Assuming 40 hours a week with two weeks of vacation, that's $450 per hour. "I guess, put simply, what are you doing on a daily basis in 2013 to sort of earn your $450 per hour?" Lawton asked on the conference call. Scarlett pleaded innocent, claiming that he has no control over his pay that's set by "external advisors and consultants" that use the going rate for a biotech CEO as a guide. Of course, his peers have earned their keep, according to the chart above. Including Scarlett's pay, Geron expects to burn through about $33 million this year. That's a lot of money waiting around for clinical trial data. Geron doesn't plan on running any company-sponsored clinical trials in 2013. If the investigator-sponsored trial comes back positive it'll start planning for the next trial, which won't start until next year. Is fighting back the best move? Lawton didn't say, but it seems safe to assume that his Catoosa Fund owns shares of Geron. The question I have is: Why bother fighting back? If you don't like the burn rate, sell at a loss and move on. Go buy Simon Property or Citigroup or one of the myriad of companies that give shareholders a say on pay. Shareholders of both companies rejected their CEO pay policies last year. Who can blame them. Citigroup's CEO, Vikram Pandit, produced a 90% loss for shareholders over five years. Or better yet, buy a successful company. Fellow Fool Daniel Miller thinks Alan Mulally is worth every penny Ford is paying him. Shareholders might balk at the nearly 1 milllion shares of stock options he was awarded this year, worth about $12 million at today's prices, but he's turned the company from red to black. Geron, by contrast, hasn't had a profitable year in its entire existence. Not that that being profitable is necessary for driving value. Seattle Genetics is still burning through cash, but investors don't seem to mind, sending shares up 75% over the last year. The company recently launched its blood cancer drug Adcetris and has a pipeline of drugs progressing toward the market; clearly they can see the light at the end of the profit/loss tunnel. Geron, on the other hand, has lost more than $850 million since it was founded in 1990. With less than $100 million in the bank, it'll almost certainly have do another round of public financing. Good thing the investment bank analysts are still talking nice. While Geron's cash burn may worry shareholders, it wasn't the macroeconomic trend Warren Buffett was referring to when he said "this is the tapeworm that's eating at American competitiveness." Find out what the legendary Oracle of Omaha was talking about in our free report: What's Really Eating At America's Competitiveness. You'll also discover an idea to profit as companies work to eradicate this efficiency-sucking tapeworm. Just click here for free, immediate access. The article What Is This CEO Doing to Earn $450 Per Hour? originally appeared on Fool.com. Fool contributor Brian Orelli has no position in any stocks mentioned. The Motley Fool recommends Ford. 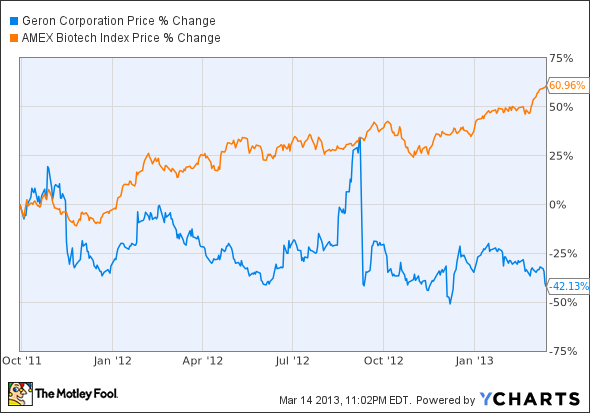 The Motley Fool owns shares of Citigroup Inc and Ford. Try any of our Foolish newsletter services free for 30 days. We Fools may not all hold the same opinions, but we all believe that considering a diverse range of insights makes us better investors. The Motley Fool has a disclosure policy.